Collingwood coach Wayne Siekman reads out Chloe Molloy's name with the third selection in the 2017 AFL Women's Draft. When your team’s coach is excited, something special must be brewing. 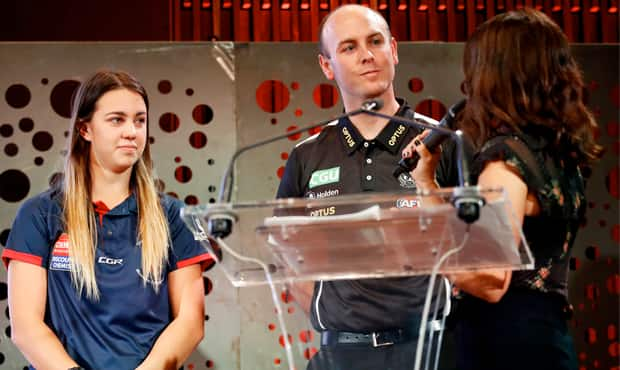 For Collingwood’s AFL Women’s team, that coach is Wayne Siekman, and his excitement is generated by what awaits during Tuesday’s AFL Women’s Draft. Collingwood will enter the meeting with five selections inside the first 19, with a total of seven new players to join the club by Tuesday evening. “Tuesday’s going to be an exciting day,” Siekman told Collingwood Media. The Magpies have set their sights firmly on building from within. Several established players left at the end of the 2018 AFL Women’s season, many bound for expansion club North Melbourne. Instead of looking to chase existing AFL Women’s players, the club is looking to use the draft as its means of building the nucleus of its future teams. “Our strategy has been in place since the trade took place and expansion hit,” Siekman explained. “Some players left the club, be it to expansion clubs or new clubs, which meant we were able to get some really good draft picks early in the draft. “The compensation we got from the AFL was a pick at the start of the second round, so we have seven open picks in Tuesday’s draft, including five picks in the first round and a half. By the middle of the second round, we’ve got five picks. “Our strategy has been to bring the youth in. As we saw last year, not just with Chloe Molloy but others such as Isabel Huntington (Western Bulldogs), Monique Conti (Western Bulldogs) and Iilish Ross (Collingwood), these kids are the future of our game. Coach Wayne Siekman presents Chloe Molloy with her Collingwood jumper during the 2017 AFL Women's Draft. Collingwood will formally add a further two players to its 2018 list on Tuesday when it officially drafts Erica Fowler and Sophie Alexander. The pair are products of the club’s VFL Women’s team, and have been rewarded for their fine work in the team’s first season in the new competition with places on the list following the season-ending injury suffered by Chloe Molloy in the VFL Women’s Preliminary Final against Geelong. “Erica played for our VFLW team this year as a Queenslander,” Siekman said. “She flew herself down every couple of weeks off her own bat to improve and try and get the best out of it. It’s been worthwhile for her and it’s paid off. She’s a forward-ruck, which will help out Eliza Hynes. “We were also able to acquire Sophie Alexander, a key forward in our VFLW program, in a similar fashion to the father-daughter rule, where other clubs could bid on her and we had to take her with our next pick. We had to take her in the middle of the third round. The draft itself will take on a slightly different format to last year’s, given Victoria’s nominees have been divided into three pools. “It’s a state based draft, which is the same as last year, but there are three different pools the players can nominate – Victoria, for all six teams, Geelong only and then metro only (the five Melbourne-based teams and not Geelong),” Siekman explained. “It’s all dependent on each player’s circumstances, and giving them options. Drafted with pick No. 3 in the 2017 AFL Women's Draft, Chloe Molloy went on to win the league's Rising Star Award just months later. Tuesday’s draft marks the beginning of a busy period for third-year coach Siekman, who will introduce his recruits and their families to their new Collingwood teammates during a function that evening. “Pre-season starts on 14 November, so they have three weeks between now and then," he said. “There will be inductions where they come in and assess their skills, goal setting, meet with our strength and fitness teams and set out their pre-seasons.